Chirp is something what I was searching and a new way to share your stuff, and this using sound. Chirp is an iPhone app which sings information from one iPhone to another. You can easily share photos, webpages, contacts and everything all from your built-in speaker. This is definitely one of the most interesting applications I’ve seen in recent weeks. Chirp allow us to upload a picture, links, contact the service and instead of producing a typical QR code, generates an auditory code. And If another person also open the application, and when we press the yellow button, and voila! The other person will see how the file on your device. Keep remember that, you need to run Chirp iPhone app to receive chirps from other users. And sharing of chirps requires a network connection. Chirp is a new way for connecting devices. It works by turning links into audio. You just have to press the big yellow button to hear the picture being chirped. Chirp lets you send information over the air to anyone running the app near you. 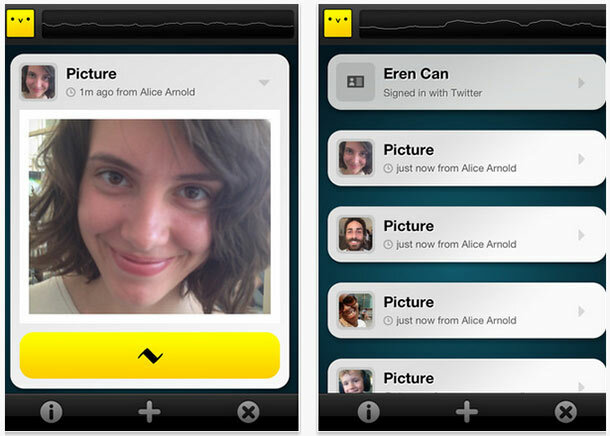 Use the app to send or receive pictures from your camera, and share with everyone in the room. Chirp is the super-simple way to share that everyone’s talking about – download it now. The only bad thing about the Chirp app is that it’s only available for IOS (iPhone / iPad). I hope they will soon bring the chirp app to Android and other platforms, but still no official words from the developers of the Chirp. Want to try this awesome iPhone app, Chirp. Then grab it asap from the iTunes store as it’s free to download.